Earlier this week we ran a story about why local livable streets advocates with the New Haven Urban Design League are disappointed with the city’s decision to replace a section of grade-separated highway with a plan that remains, on balance, car-centric. We agree that there is too much parking in the corridor, and the road remains too wide, but we have to disagree with the assertion that what is being proposed is only marginal improvement. This project, even in the first phase, will be implementing some of the most progressive transportation infrastructure in the state. Some of this infrastructure, to our knowledge, are firsts for the entire state of Connecticut, including the first ever bike boxes, separated cycle tracks, and raised intersections at particularly wide intersections. Meanwhile, Elizabeth Benton, a spokesperson for the city, took issue with some of the assertions from the Urban Design League, including the claim that the roadway replacing the highway will have no through streets. Phase I of the project — the phase that New Haven has collected about $30 million to build out — does not include side streets. Those are supposed to be built in Phase II, said Benton. Future phases are not yet funded, she allowed, but she said the city is committed to finishing them. In other news about this project, Anstress Farwell, president of the Urban Design League, is traveling to Washington this week to speak with representatives of U.S. DOT about the organization’s concerns. Many thanks to Ryan and Elizabeth for bringing us another dimension of the teardown proposal. Responses like these help us report on nuances and alternate perspectives that we might not be aware of when we first cover a story. Thank you! It is incredible that the City now asserting that precisely the plan which it abandoned, is the City’s current plan. 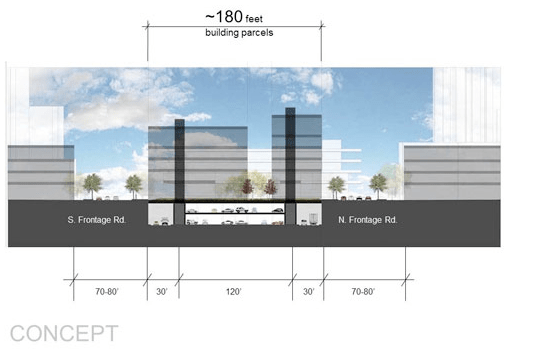 The plan shown above, with a 180 foot wide platform to accommodate underground parking and travel lanes below and building sites above, is not the City’s current plan, it is the concept plan developed in the 2007 South Central Council of Government (SCRCOG) study, done by Clough and Harbour. This SCRCOG concept plan, with underground parking and service lanes built into the existing highway trench, enabled a full roster of positive design strategies on the city streets: a separation of driveways and loading docks from public areas, fewer lanes (three instead of five), efficient build-out of available land, full build-out of active uses on complete and safe city streets. The SCRCOG plan was set aside when the City decided to use a developer’s plan, a 160 foot wide building, through the basement of which with an 800 car above ground parking garage, attached to the 2,600 car Air Rights Garage, as the basis for a TIGER II application. The developer’s plan is focused on a fast build-out, and eliminates the platform, not only for this particular building, but for any subsequent build-out in the Downtown crossing zone. This loss is inevitable result of locating underground service lanes in the center of the trench. The new fill-structure bridge at College Street accommodates this wasteful plan, an effective coup de grace for any hope that better plans in future phases can making up for the short-sighted choices of this first step. Rather than build on SCRCOG plan, the City’s 2009 TIGER II application, which is the current plan, abandoned fundamental and progressive infrastructure for a plan devised to maximize vehicular traffic and ABOVE GROUND parking — all in a district that already has phenomenally high quantities of structured parking and traffic congestion. If it were possible for the City to revise its TIGER application, and submit a plan based on the Clough and Harbour concept, we’d cheer it on. The problem now it time — after stiff-arming the chorus of residents and public interest design advocates working for safe streets, complete streets, transit development, air quality improvements mixed-use development, and a strong and diverse economic development plan — the City is falling far short of fulfilling even the narrowed goals outlined in the TIGER II application. That application claims it will remove the highway, increase connectivity, build urban boulevards, and create a Transit Oriented Development. None of these promises are fulfilled in the current plan. The plan still not address the walk ability and connectivity of the neighborhoods. I think the focus also should be the linkages to the train station which have not been addresses. Residents would like to see a residential components and repair of the damage done with the Air rights gagage. This is NOT the plan the city has been prompting this is a plan done by the the Council of Goverments. They are trying to cover up the horrendous plan they are proposing because it does not meet any of the Tiger grant guidelines. The plan shown abobe was proposed in the fall of 2010 by the City of New Haven as Phase II to the Route 34 Downtown Crossing project. This is not Clough Harbor’s plan nor was it commissioned SCRCOG. The critics of the current Route 34 plan really need to get their facts straight and investigate the realities of this process prior to making uniformed criticism. I was very excited to see this, but after some research I see this is the worst of both worlds. I’ve always figured that a) the highway should never have been built BUT b) having been built, it should have been continued to Forest Rd. and West Haven. The idiotic half-built Rte. 34 connector has been neither nor. And now I see this plan is a continuation of the “neither-nor.” Make up your mind: highway or no highway, and then build it right. Stop trying to build a “half-a-highway.” It’ll never work. Goodbye Downtown New Haven Highway, Hello 1,300 Parking Spaces?